Integrated Pest Management Advisor – UCANR-UCCE-Los Angeles. Disclaimer: This document may be outdated. Readers should get the most updated regulatory information from federal, state, county, and city resources. Remember, laws change all the time! Example: If the recommended label rate is 1 lb per acre, you can use a reduced dose of 0.5, 0.3, 0.2, or 0.1 lb per acre for your application without breaking the law. However, you cannot apply over 1 lb per acre if that’s the maximum allowed dosage allowed on the label. Example: If an insecticide label does not mention the dark rover ant as one of the target organisms and does not prohibit treating this ant, then, applicators can use the pesticide against the dark rover ant in a turfed residential backyard provided that residential areas is listed as an allowed application site. 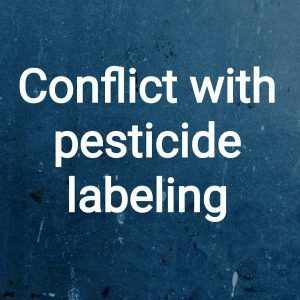 Example: If a pesticide label recommends broadcasting a granular insecticide bait over an area but does not prohibit using it in a bait station, pest control experts can place the granular bait in a bait station provided that other directions such as maximum allowed rates are followed. The use of personal protective equipment consistent with the exceptions and substitutions in section 6738. To fumigate or not to fumigate?